26 E 485 Private, Burgess, John A 136 lnfantry, Feb. 1, 1863 Frederick.
" " 502 " Beer, Samuel A 14 Cavalry, Aug. 6, 1863 "
" " 508 " Bucher, Henry E 151 Infantry, July 14, 1863 "
" " 512 " Brancroft, A. J. I 14 Cavalry, May 11, 1864 "
" " 532 " Brochman, D. F 12 " Aug. 6, 1864 "
" " 557 " Bennet, Thomas H 5 " Sep. 19, 1862 "
" " 565 " Brine, Charles 46 Infantry, Oct. 4, 1862 "
" F 569 " Baxter, B. D 72 " Oct. 2, 1862 "
" " 577 " Burton, Jered M. A 107 " Oct. 9, 1862 "
" " 583 " Baker, M. Teamster, Dec. 27, 1862 "
" " 587 " Berry, John S. K 28 Infantry, Apr. 7, 1862 Age 32. Frederick.
" " 601 " Banlus, Samuel F 110 " Cumberland.
" " 603 " Beavers, Norman I Cavalry, "
" " 624 " Boggs, Albert D 1 "
" " 629 " Bouch, Isaac M 14 Cavalry, Sep. 28, 1864 Clarysville.
" A 30 " Clark, Elvin L 12 " July 30, 1863 Antietam battle-field.
" " 60 " Crick, J. W. 28 Infantry, "
" " 81 " Carr, B. 69 " "
" " 91 " Carpenter, George W. G 111 " Sep. 17, 1862 "
" " 95 " Cole, Campbell H 6 Inf. 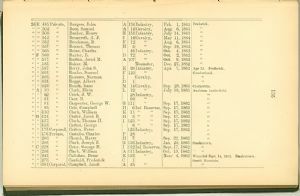 Reserves, Sep. 17, 1862 "
" " 110 " Clark, William K 11 " Sep. 17, 1862 "
" B 124 " Crater, Jacob B. H 3 " Sep. 17, 1862 "
" " 137 " Clark, Thomas H. I 125 " Sep. 17, 1862 "
" " 153 " Carton, George 8 " Sep. 17, 1862 "
" " 175 Corporal, Carton, Peter 125 Infantry, Sep. 17, 1862 "
" " 176 Private, Castello, Charles P 28 " "
" " 200 " Church, Harry H 7 Sep. 22, 1862 "
" " 208 " Clark, Joseph Z. G 136 Infantry, Jan. 20, 1863 Smoketown.
" C 228 " Cator, George H. I 132 Inf. Reserves, Sept.17,1862 "
" " 236 " Clark, William A 111 Infantry, Oct. 13, 1862 "
" " 243 " Callahan, Peter K 123 " Nov. 4, 1862 Wounded Sept.14, 1862. Smoketown.
" " 275 " Canfield, Frederick C 1 South Mountain.
" " 301 Corporal, Campbell, Jacob A 45 " "